After the H1B Visa interview at US embassy in Delhi, India, Visa officer took my passport and told me Congratulations, your visa is approved and I will get the passport in 2-3 days. I just checked my CEAC status online and it says: Administrative Processing. I did NOT receive any form 221g or any other document whatsoever. Why is it in Administrative processing then? This is pretty common question in this situation. 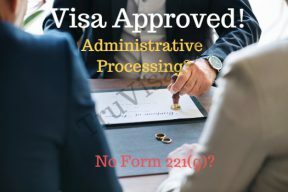 Administrative processing is the normal status and could mean multiple things with or without form 221(g). Many times, US embassy will not issue form 221(g) just because they do not need any documents from you. But, they can still send your application back to USCIS in USA for US work location verification. In this case, your application status will show as Administrative Processing even though the visa officer told you VISA APPROVED. If your visa was approved and they did not give you any form 221(g), then you can expect a response/ passport within 3-7 days. Visa Officer (VO): How are doing today? A: I am doing fine. What about you? VO: What class of visa have you applied for? VO: Which company are you going to work for? VO: What is the education of your wife? VO: Where have you lived in US and where are you going to live now? A: Tampa, FL and Westford. -I was interrupted by my kid here. So, could not answer completely and was immediately followed by another question. VO: Westford? Where? In Massachusetts? VO: Is there any client or you are going to work directly for this company? A: There is no client. The work is directly for ABC company. VO: Please move to the next window and my colleague will help you. Q: When did you change your address in last 15 years? Is it in 2006? A: I thought they are asking specifically about India as i was in India in 2006. I answered Yes, and gave my Indian address before and after 2006. Q: Do you have any brother/sister? Q: What is the name of your sister? Q: What is the name of your brother? A: I don’t have any brother. Q: When do you intend to travel? They hand over the form 221g with all the information crossed. They kept our passports with them. Problem: In this case, this person forgot to tell one of his address that he lived in USA to VO officer. VO did not tell this to the person but instead, just issued a form 221(g) with no documents to submit. Solution: Attorney and person went through the full transcript of the interview (as written above) and concluded that VO probably has doubts on person’s identity since he forgot to mention all his US addresses clearly. The Attorney in USA then sent an email to USCIS directly with clarification on the address that the person forgot to tell the Visa Officer. The US Embassy was satisfied and they cleared the ‘Administrative processing’ within a week. The person had his H1B visa approved in 7 straight days including weekends. A smart attorney can really take you far! It is also possible that with NO Form 221 (g) was issued and Visa officer told you ‘Visa Approved‘. Your dependent’s H4 gets approved but your own H1B visa status shows as ‘Administrative Processing‘ online. This generally happens when US embassy is just verifying primary H1B’s credentials a little bit more or have sent H1B’s application to USCIS to confirm some more information. One of them could be ‘Work Location‘. No need to worry, you will get your H1B approved. Remember, H4 cannot exist without H1B. If H4 has already been approved, your H1B is also on the way. Just a couple of more days to wait! This is a unique case where there are no documents need to be submitted but you are still issued form 221(g). Normally, Visa officer will just put a big cross on the form 221(g) and handover to your. They will also keep your passport with them. Why Identity / Security Checks with Form 221(g) are done? This is needed so the government can complete its security clearance on the person for the visa issuance. This is not a process that can be expedited, as the State Department (through the Embassies) takes its security obligations quite seriously. We have found that once someone supplies the missing or corrected information, the security clearances can take 1 to 8 weeks, and unfortunately, the government shut down does delay these clearances. While we know it is frustrating to be told there is no precise date, the application is in the hands of the State Department and they do not have any specific time limitations they must abide by if they decide someone’s case needs additional security clearances. Sometimes, these clearances are requested just because someone with a name similar to ABC’s name is on a watch list of individuals who committed a crime – and then the Embassy must be sure it can clearly determine that ABC is NOT that person. applied for A2 visa in jan 1st week..me and my colleague..us consulate asked some questions after 4 weeks. we both replied same answer separately..again same was asked to my colleague and revised departure date in march 2nd week whereas i didn’t get anything so far.. it s almost 3 months.. what is the reason for this and why this much delay? Nobody can guess the reason for delay. Most of the time the reason for longer delays are background checks and security checks on your name. first time documents were asked to both whereas second time it was to only one person…what is the reason ?when contacted it was told that each case is unique.. can it be like that? Off-course each case is different as you and your friend are two different individuals and may need different security checks. I went for the interview on 5th March and in less than 3 mins interviewer issued me 221G form (checked 3 documents) and returned me all passports (including family). I sent all required documents via email. But have not received any updates since 7 days after I sent the docs. How long it will take. What documents were requested in your form 221(g)? My suggestion is to be prepared for longer wait like 8+ weeks based on the documents visa officer has requested. One more question, According to USCIS email they have asked me to submit the passports along with 221g and i797. Does that mean it is approved and they have asked in order for stamping? When did you receive this USCIS email? Are you sure you received an email from USCIS or US embassy? Also, when did you submit your passport? with your 221g documents or more recently? I am currently pursuing my double masters degree and working on CPT status. I have previoulsy utilized 3 complete years of OPT. My emoloyer is applying for H-1B this year and recommened me to apply H-1B on the outset as a conuslar petiotion to avoid additional scuritny of my current status. They are not suggesting to apply H-1B along with change of status. They have asked my opinion and would like to take suggestion from you if applying H-1B as consular petition will do any good rather than applying H-1B along with change of status. I need to send response to my attorney by Monday there your response sooner will be gresty appreciated. Your question about filing H1B with consular processing after OPT is out of scope of this article. Hence, I have added it to our forum and answered there.